When Wesley was only fiv years old, his mother, Beverly Crusher, was killed after the Romulans attacked Delos IV. Wesley then went to live with his father on Utopia Planitia till he was fifteen when he father was promoted and transferred to the Enterprise-D. Wesley often was a challenge although Wesley's astuteness and knowledge of engineering, as well as top grades on scientific examinations continuously impressed Rice. These same characteristics were, in part, the cause of Wesley suffering from loneliness early on, as his peers were intimidated by his bright mind – he also showed a tendency to take his duties almost too seriously. 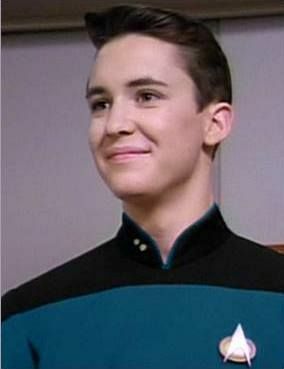 Wesley excelled at his studies aboard that vessel and through the primary school found himself participating in work-study programs alongside many of the Enterprise's senior officers. When in 2364 the crew of the Enterprise became intoxicated with polywater and exhibited unusual manic behavior, Wesley, who had also became intoxicated, took control of engineering, appointing himself acting captain Wesley Crusher and barricading himself in engineering, watching as Jim Shimoda pulled out most of the isolinear chips that controlled the navigational system of the ship. This put the Enterprise in danger when a stellar core fragment was hurtling in their direction. However, the incident did allow Wesley to display his knowledge of the ship's inner workings and he proposed that they turn the starship's tractor beam into a repulsor beam to push away the Enterprise. This move gave the Enterprise the extra time needed for Data to finish the repairs so the ship could move. In 2364, Wesley befriended The Traveler when he accompanied Kosinski aboard the Enterprise-D to assist with warp drive efficiency upgrade experiments. When the ship was transported millions of light years to the M-33 Galaxy, Wesley assisted The Traveler in returning the ship to their own galaxy. It was just before the Enterprise's return to its original position that The Traveler informed Captain Rice of Wesley's prodigious abilities, telling him that Wesley was a genius with the intricacies of time, energy and propulsion and that those talents needed to be encouraged. However, he emphasized that Wesley should ever be told any of this, as it was important that the boy cultivate those abilities naturally without interference. Captain Rice, who was also very impressed with Wesley's contributions during that mission, granted him the field commission of acting ensign "for conduct in the true spirit and traditions of Starfleet" on stardate 41263.4. He told Wesley that whether that rank became permanent depended on him. He also instructed Commander Ben Sisko to make out a duty roster for him to learn the ship and its operations from top to bottom so he would be ready for the Starfleet Academy Entrance Exam. During a visit to the planet Rubicun III, Wesley accidentally disturbed the plants while playing—and, as punishment, was sentenced to death. Even though Rice was shocked at the sentence the inhabitants of the planet, the Edo, had imposed on Wesley, he nonetheless decided to respect their laws by not immediately beaming away "the Wesley boy". Rice discovered that the Edo were provided for by a mysterious object in their planet's orbit. After much inner struggle and extensive negotiations with the Edo that proved unfruitful, Picard decided that in this case he had no choice but to violate the Prime Directive to save Wesley's life. Prepared to battle the entity in space if necessary and over the Edo's objection, he attempted to beam Wesley to safety to find the Edo God was preventing it. However knowing they could hear him, Rice successfully argued that the sentence was unjust and laws with no leeway or exceptions was an injustice in itself. The entities accepted the argument by allowing the beam-out. In the attempt by Lore to hijack the Enterprise, it was Wesley who discovered that Lore was impersonating Data. In the beginning no one believed Wesley and he was sent off the bridge for making the accusation, but it turned out that Wesley had been in fact correct about Lore all along. Late in 2364, Wesley took the Starfleet Academy entrance exam, but did not pass. Wesley was given the assignment of piloting the shuttlecraft to take Counselor Miller to a conference. Wesley was promoted to Ensign getting to wear a Starfleet uniform and everything. During the return trip an entity named Armus pulled the shuttle off course causing it to crash on Vagra II. Wesley was injured in the crash and was unconscious until he and Counselor Miller were rescued where he was informed of Lieutenant Yar's death. Rice tried to offer him some words of comfort after he witnessed the destruction of the USS Yamato. In 2365, Crusher met Salia, a young girl who was to be the ruler of Daled IV. Salia was tended to by Anya, an allasomorph who could change shapes. She threatened Wesley but was stopped by Salia. Although she, too, was smitten with Wesley, she chose to do her duty and left the Enterprise. In 2365, William Riker assigned Wesley command of a science team with the mission of investigating Selcundi Drema. Wesley chose Prixus, Alans, Hildebrant and Davies to serve on his team. Wesley then named to be the Assistant Chief Science Officer to Lieutenant Data. Wesley and La Forge worked closely together on preparing the eighty year-old USS Hathaway for a simulated war games battle against the Enterprise during Operation Lovely Angel. One of Wesley's experiments went wrong and almost destroyed the Enterprise. He had created nanites, small robots, that were replicating and becoming sentient. After a scientist on board Enterprise, Doctor Paul Stubbs, tried to kill them because they had interfered with his experiment, they attacked the ship. Data allowed them to enter his body in order to speak through him, and a solution was found. When Data was believed killed in a shuttle explosion Wesley was promoted to Lieutenant junior grade and named Chief Science Officer. After Data was returned to the Enterprise alive and well Data resumed his duties as Chief Science Officer but Wesley was allowed to keep his rank of Lieutenant. Wesley successfully completed his written exams for Starfleet Academy in 2366 but did not complete his oral exams that year when he failed to board the USS Bradbury for the journey to Earth. Wesley was able to join the Academy mid semester in early 2367 leaving the Enterprise-D. When he graduated he was returned to the Enterprise-D after completing his post graduation leave. Later in 2372 he was on the Prometheus with his father when it was forced to slide from his quantum reality. Once in the Prometheus' home quantum reality Wesley became the Chief Science Officer on the Stargazer where his father was First Officer. In 2379 he was reassigned to the Curie to continue to serve with his father and a duplicate of his mother.